I don’t have much to say in the sermon today. I just want to reflect briefly on the act of remembering and then for us to do these sacramental exercises of remembrance. What are the things that evoke memories in us? I think it usually comes from one of our senses. Have you ever been preparing a Thanksgiving meal and the smell of the food preparation reminded you of your childhood holiday celebrations? Have you ever been stopped in your tracks at the sight of a sunset or some other beautiful scene that brought back memories of some beautiful experience you’ve had in your life? Have you ever heard a sound, a story, or a song that you haven’t heard in years and you’re brought back to the time and emotions you felt when that song really hit home with you or when that story was the present? Have you ever taken a bite out of a simple meal or licked an ice cream cone or lollipop in your adulthood and were taken back to a time when you enjoyed such a meal with your parents or grandparents? It’s like that scene on the movie Ratatouille when the food critic who scoffed, at first, that a meal typically served in peasant settings was served to him. Yet when he took a bite, he felt the memories of childhood bliss that no delicate 5-star entrée ever delivered in his career of critiquing food. Have you ever touched your child’s hand or kissed them good night and were brought back to the day of their birth or of their infancy when you put them to bed? It’s amazing how experiencing things through the five senses bring back memories in ways that just trying to mentally think of something just wouldn’t. 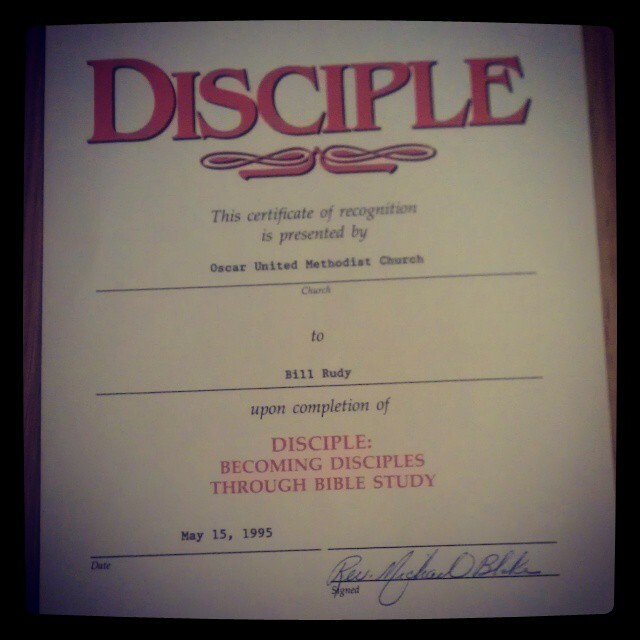 A certificate of completion for the Disciple Bible Study given to my grandfather in 1995. Papaw died 3 years later. You see, God made us to be people who are sensory. This week I was searching for Scripture passages that talk about the act of “remembering.” I went to a concordance, not really thinking about where the concordance came from when I out popped this [pictured above] certificate of recognition for my Papaw’s completion of Disciple Bible Study. When I saw this certificate I remembered that the concordance it was in belonged to my grandfather and had been passed down to me. And as I paused to take in the sight, feel the texture of the certificate and even smell it, I remembered Papaw in some very meaningful ways. You see, I went through that Disciple Bible Study with him and Granny and remember seeing him intently reading Scripture and taking part in the in-depth discussions around the tables at Church. I remember the ever-so-distinct smell in Papaw and Granny’s house and not just around Thanksgiving and Christmas, but year-round. I remember the touch of soft velvety pad on top of the piano bench that doubled as a gate that he would open as I would ride on the back of Dad, or one of my uncles or brothers pretending to be a cowboy riding a bull in a rodeo. I remember the sound of his voice as he would count out loud and see if I could hang on for those 8 seconds. I remember the feeling of his arms around me on nearly every Sunday after Church when he would wrap us grandkids into his arms that he called a “bear trap.” All these memories unlocked by a simple almost accidental exercise of the senses. Memories are stored in our minds through stories and experiences. And the keys that unlock them are usually something tangible, something sensory that takes us back to those precious times in our lives, but more importantly remind us of who we are and to WHOM we belong. That’s why God gave us things we experience through our senses to communicate grace to us. These common or ordinary elements (water, bread, wine or juice) become extra-ordinary as the Holy Spirit uses them to pour grace into our lives. God gave us these tangible gifts as ways to remember God’s faithfulness even when we can’t “feel him” or when we’re not sure where God is. That’s what the Psalmist is doing in Psalm 77. They are frustrated, bewildered, doubting, all the while calling out to a God who seems to be so absent. And what should we do when we feel the same? Do like the Psalmist does: remember the faithfulness of God. These sacramental acts guide us in that. When we gather at the Font that cleanses us and when we gather around the Table that nourishes us, we remember Jesus Christ, his life, death, and resurrection. But it’s not just a mere memory, because Christ is no longer dead. He lives! And when we remember our baptism, that is our identity in Christ through this water, and when we break the bread and share the cup, the living Christ is really present with us in these moments, in this meal, by the Holy Spirit, reminds us of our identity as God’s children, and empowers us to be agents for God’s kingdom. Thanks be to God. In the name of the Father, and of the Son, and of the Holy Spirit.